At J.T. Bates Insurance Group, we’ve seen some stuff. 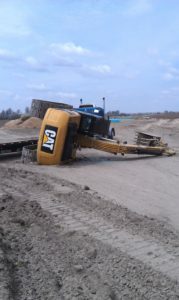 Such as this excavator in a place it really should not be. 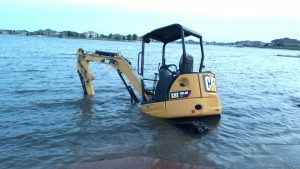 Water accident covered by Rental Equipment Protection from J.T. Bates Insurance Group. We even paid for the damage to this overturned piece of equipment. Overturned equipment covered by Rental Equipment Protection from J.T. Bates Insurance Group. These are just some of the different types of losses we cover every day. However, submersions and overturns are not the most common types of losses. According to an annual report from the National Equipment Register(NER), equipment losses due to theft could be as high as $1 billion with less than 25% of those losses recovered. Until 2015, theft has been the most frequent loss reported by equipment owners since NER began reporting on these losses. Theft doesn’t only increase costs for equipment owners, it reduces profitability for renters as well due to down time and loss of productivity. Protecting equipment from theft is crucial to efficiency and profitability of any construction business. By implementing a few security measures, equipment owners and renters can make sure their money isn’t wasted. 1 – Be diligent. Background checks for operators, thorough inspection and familiarity with a jobsite, and retrieving equipment as soon as possible after a job is completed are a few low to no cost best practices that can reduce equipment theft. 2 – Utilize technology and other security measures. Many newer pieces of heavy equipment are fitted with telematics systems that make it possible to remotely monitor equipment location and other use data. Adding multiple layers of security measures, like security personnel and video monitoring can reduce theft even further. 3 – Report theft and fraud immediately. Identifying and reporting problems is the first step in solving them. Report theft and fraud immediately to the local authorities and cooperate with police efforts to recover stolen equipment. Background checks help here as well to identify past offenders or fraudulent applications. 4 – Protect your equipment investment. Losses happen. With Physical Damage Protection (PDP) for long-term lease equipment and Rental Equipment Protection (REP) from J.T. Bates Insurance Group, equipment losses due to theft are covered and the equipment owner receives replacement cost value on equipment newer than five years old. All risk coverage, found in PDP and REP, is the best way to protect equipment with competitive rates and a waiver of subrogation. For more information on Physical Damage Protection™ (PDP) or Rental Equipment Protection™ (REP), call us at 1-877-900-8729 or contact us here.